Now this is a case to really get your teeth into and it absolutely fascinates me. It's probably best if you get this diagram up before you read further. The story of the Oak Island Money Pit is a mystery and adventure in the grand tradition of swashbuckling epics. It's also a tale of tragedy, failure and perhaps even stupidity. Our story begins in 1795 with a sixteen year old boy named Daniel McGinnis. He made a discovery on the Nova Scotian Oak Island while fishing which would, over the next two centuries, cause people to lose their minds, and sometimes their lives. It was just a simple circular depression in the ground. The depression was under a tree and suspended from the overhanging branches was a tackle block (a type of pulley). This piqued his young, pirate adventured filled interest and he and a couple of friends (John Smith [in early accounts, Samuel Ball] and Anthony Vaughan) decided to "excavate" it. A few feet down they discovered a layer of flagstones and I suspect at this point they all gave each other knowing grins. A pulley system, a hole and signs of protection on an island on the Atlantic seaboard? Did somebody say "treasure"?! As they continued to dig, and I'm sure with a little more enthusiasm now, they noticed the walls of the pit were pitted with pick marks and at every 3 meters they found a layer of logs. 30 feet down (that's 10 metres for folks like me) they decide to give up, probably not without much soul searching. They promised to come back and continue where they left off once they were better prepared. There was some talk in the press of the discovery but it took another 8 years before anyone returned to the Money Pit. Daniel, Anthony and John plus Simeon Lynds formed the Onslow Company and set out from central Nova Scotia to resume digging. Now they had the backing of an eager workforce willing to work for a slice of the treasure. This time they managed to get to 90 feet down and found layers of logs about every ten feet (3 m) and layers of charcoal, putty and coconut fibre at 40, 50 and 60 feet (12, 15 and 18 m). Now this is where things take a turn for the interesting. Supposedly at 90 feet they found a large stone with inscriptions upon it. Various people tried to translate it with one coming up with "forty feet below, two million pounds lie buried." Wishful thinking or amazing detective work? Sadly, but unsurprisingly for such a story, the stone disappeared in the early 20th Century. They had been experiencing problems with visibility and waterlogging the Saturday following their discovery and after breaking through another layer of logs they called it a day. The next day was Sunday and by the time they returned on Monday the pit was flooded up to the 33 foot mark. After a brief attempt to bail out the water, the project was abandoned until the next year. That next year they tried to drain the pit by building a second shaft, but this ultimately collapsed and finally defeated they accepted the treasure was not to be theirs and left the island for good. Many years later in 1849 the Truro company was formed by investors and they excavated down to 86 feet before the pit flooded once more. But they weren't going to let that put them off. They decided to drill deeper to see if they could recover any further evidence of what might lie beneath... the drill passed through a spruce platform at 98 feet (30 m), a 12-inch head space, 22 inches (560 mm) of what was described as "metal in pieces", 8 inches (200 mm) of oak, another 22 inches (560 mm) of metal, 4 inches (100 mm) of oak, another spruce layer, and finally into clay for 7 feet without striking anything else. There was nothing else they could do but give in and call it a day. In 1861 a new company, the Oak Island Association, began a new attempt but the curse of the Money Pit would strike again; this time the bottom of the shaft collapsed (depending on your viewpoint either into a natural cavern or into a bobby trap). Then disaster following disaster there was the first, but not the last, fatality on a Money Pit dig when the boiler of a pumping engine burst. By 1864 the company had exhausted their funds and their options and, inevitably, they gave up. At least 8 further attempts would be made between then and the 1960s (including one in 1909 which featured a rather famous prospector; Franklin Roosevelt!) and most met with no success. One fared worst of all when a worker fell to his death in 1887. In 1928 Gilbert Hedden read about the mystery in a newspaper and it wasn't long before he'd purchased the part of Oak Island which contained the money pit. He eventually began excavating in 1935. He attempted to dig where he thought a previous secondary shaft had been excavated in 1897. He dug 163-foot down and found several pieces of work gear and a Cornish pick. But given the amount of work carried out he couldn't ascertain whether this was from a previous dig or from the original excavation that supposedly created the Money Pit. In the 1960s the excavation was brought into the modern age with the use of a 70-ton digging crane with a clam bucket to create a huge pit, over a 100 foot wide and 134 feet deep. Despite this nothing was found. Sadly tragedy struck once more and four people lost their lives when they were overcome by fumes in the shaft. In the late sixties Triton Alliance arrived on the scene and bought most of the island. In 1971, Triton workers excavated a 235-foot (72 m) shaft supported by a steel caisson to bedrock. According to Blankenship and Tobias, cameras lowered down the shaft into a cave below recorded the presence of some chests, human remains, wooden cribbing and tools; however, the images were unclear, and none of these claims have been officially confirmed. 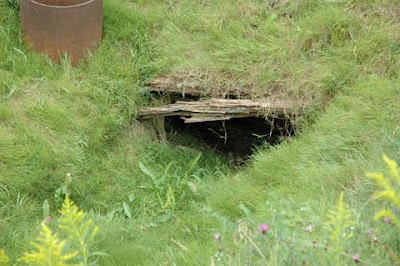 The shaft subsequently collapsed, and the excavation was again abandoned. This shaft was later successfully re-dug to 181 feet (55 m), reaching bedrock; work was halted due to lack of funds and the collapse of the partnership. So is there really treasure in the Oak Island money pit? Could it possibly be just a sinkhole? Wouldn't that be ironic.... but it is one of the more likely theories regarding the money pit. But let us not dwell upon this too sensible, heartless theory and instead ponder who might have buried treasure on Oak Island? Many of the more romantic treasure hunters believe it is pirate treasure and not just any old pirate! No, some believe that Captain Kidd used the island to store his treasure before he died, and Gilbert Hedden even traveled to the United Kingdom to follow up his belief that this was the case. Other believe French army engineers, hoping to hide the contents of the treasury of the Fortress of Louisbourg from the British, dug the hole which might explain the complicated construction. And if you thought these theories were grand, you haven't heard nothing yet... some believe a servant of Marie Antoinette managed to persuade the French Navy to hide her jewels here. And things really start to go insane here; still others believe that the last works of Shakespeare are buried under the Money Pit and some even believe the Knights Templar (those stock conspiracy theory guys used to explain every mystery ever) buried the Holy Grail here! Now that would be a turn up for the books. Millions of all sorts of currencies have been spent attempting to excavate this pit, in search of possible unknown amounts of treasure. 6 lives have been lost and people have spent many years of their life dreaming of what be lying below their feet. But nothing concrete or substantial has ever been found... only tantalising hints and clues, just enough to keep hope alive and ensure that people will probably still be trying to excavate the pit in a hundred years time. And who can blame them? Whether it's a sinkhole, a hoax or buried treasure one thing the pit has offered up is a sense of adventure, purpose and mystery. Maybe that is the real treasure after all. Arrrr. Shiver me timbers - great blog post me hearty!